What do we mean by 'qualified labor'? Qualified labor refers to having the most qualified professional perform the scope of the work you are specifying rather than basing the decision on lowest cost. From a technical perspective, qualified labor means having successfully demonstrated a tile installer's skills that meet tile industry standards. That is what the Certified Tile Installer (CTI) program does. 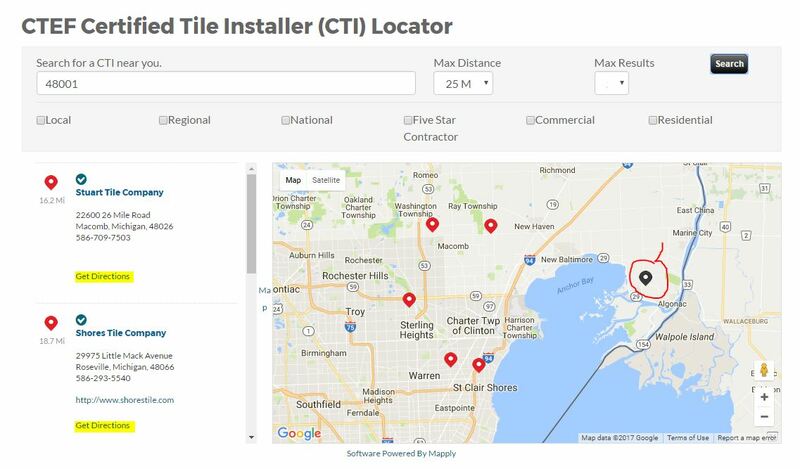 The CTI designation identifies the professional installer who has reached a level of proficiency to independently and consistently produce a sound tile installation that displays good workmanship. Any installer may take the Certified Tile Installer (CTI) exams if he or she has at least two years of verifiable experience as the lead installer setting ceramic tile on a full-time basis. That means having had full responsibility for substrate prep, layout, coordinating with other trades along with properly installing underlayment, tile, grout and sealant materials. Certified Tile Installers routinely demonstrate the knowledge, skill, experience, time management and other traits needed to produce high quality, long lasting, successful installations using United States Tile Industry standards and methods along with time-tested proven best practices. 1. 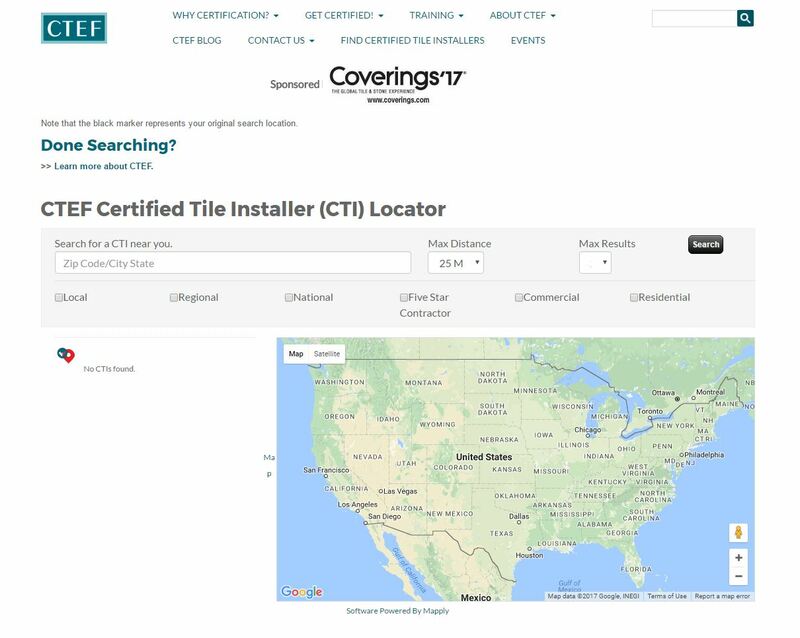 Go to the CTEF website Find a Certified Tile Installer page. 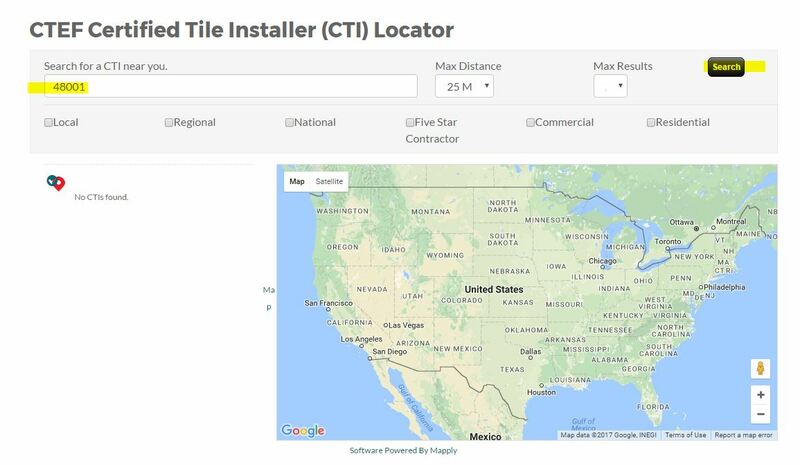 You'll discover the zip code based search tool for finding qualified tile installers in your area. In the box labeled "Search for a CTI near you," enter a zip code or city, state. You can adjust your Max Distance to customize your search. Once you do, you'll have results from which to choose. Note that the black marker (circled below in red) represents your starting location. Note, too, that the listing on the left includes a "Get Directions" button which will provide you with detailed instructions for traveling to that specific location from your starting point. 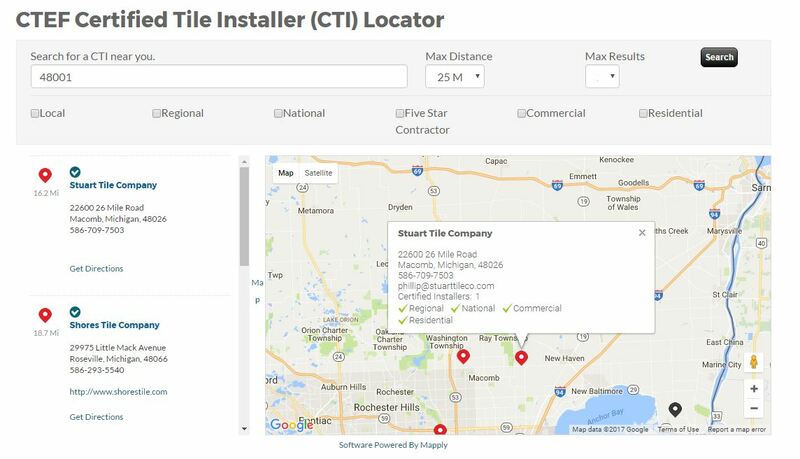 When you click on a Tile Installer listing on the left, a more detailed card on the company will appear on the map itself. This card includes contact information, details the number of CTIs on staff, and the company's specialties. In fact, you can search specifically on those categories. Select and interview at least three tile contractors. >> Here's a 5 page questionnaire CTEF has developed with questions to ask your contractor about your project, the contractor's qualifications, experience and their employees. You want to understand who will be doing the work, whether your choice is in compliance with insurance, liability, workman's comp, any applicable state licenses, and local codes. The tile installer you hire should welcome your questions and the opportunity to demonstrate his or her qualifications. "... When you go into an estimate you must be armed with knowledge and have with you the proof of that knowledge. You must be licensed, certified, insured and have proof of that along with the literature that proves what you are trying to convey to your customer. You may be the only one explaining that it is necessary to install expansion joints however if you backup what you are explaining with the proper credentials and literature they will not only believe you but you will get the job. I leave a copy of my license, any certifications, liability insurance with every estimate that I give. Also if a customer would like references I leave them a copy of every customer that I have confirmed with and explained to about this list with that new potential customer. After you complete a job you ask the customer if they could be put on a referral list in which they could receive a call from a potential customer. Some people like their privacy and I respect that, however most people will agree to be on the list..."
How easy was it to communicate with the installer? How well did s/he listen to the homeowner or specifier? How pleased is the reference with the quality of the work? Would the reference hire the installer again? Would the reference do anything differently? What were some of the details of the reference’s installation project? Can you see the completed work – either in person or via photos? Did the installer show up on time during the project? Was the installer clean, neat and respectful of the home or job site? Were final details completed in a timely manner? How were unexpected situations handled? Was a signed contract in place before the project began? Did the installer fulfill the terms of the contract? How professional, ethical, and honest was the installer throughout the process? As you proceed through your conversations with your three installers and their references - especially if you cannot confirm that your candidates are Certified Tile Installers - be on the lookout for warning signs. >> See When to Avoid Hiring a Tile Contractor: 10 Warning Signs! And you want to ensure you are hiring a true professional for your tile installation project. You can't ask too many questions. Questions help anticipate issues and ensure a better overall experience and final installation. Is my home structurally adequate for tile? For example, if you are replacing vinyl floorcovering with tile and adding a granite countertop, will the structure support the weight? Do we need the services of a structural engineer? Will there be days when no work is done due to drying or curing time? What about my existing floor? What if there's asbestos, or the paint has lead? What do you suggest for the transition from the new floor to the adjacent floor? How long will I be out of my home/space? Will any sub contractors be included in your bid or are they part of a separate contract? Are plumbers, electricians, or other subcontractors all properly licensed and insured? True qualified labor will follow up with a written agreement. Detail selections and design options. If you have any detail work in mind, require that the contractor provide a mockup. If you have tile with extreme color variation (i.e., V4), be certain that all parties understand the variations. A mockup helps here, too. In the tile world, mockups should be used as a tool by the tile contractor to obtain the approval of the owner and possibly also the architect, designer, and general contractor - all important specifier constituents for the end project. Establishing how the finished tile installation will appear before the work begins is a wise choice which can save time and money. A mockup can consist of photos, digital renderings as well as laying out a box of the tile to see the range of color and texture. Set expectations for the tile installation project. The written agreement sets expectations for payment as well as for scheduling. Make sure there's an allowance for changes and that you have a reasonable completion date. 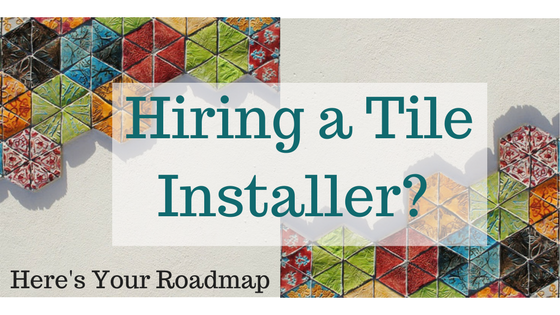 Are you ready to hire a tile installer? 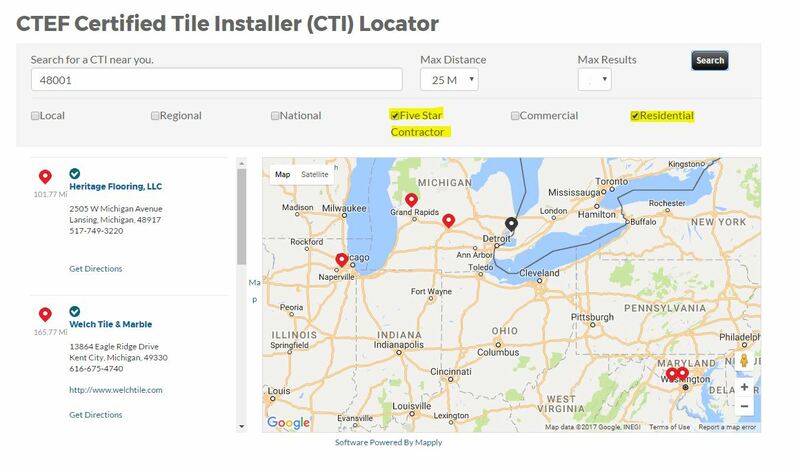 Follow the roadmap we've outlined and you'll be on your way to a beautiful tile installation. If we missed anything, be sure to let us know in the comments.